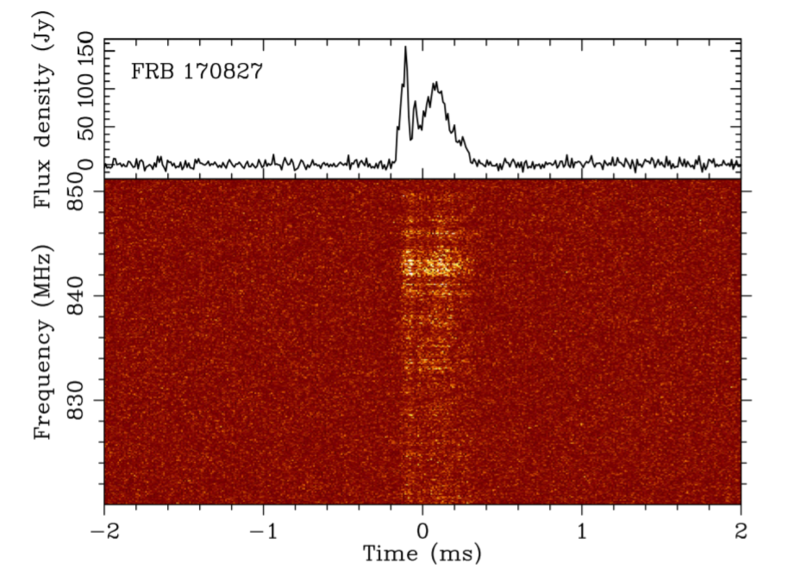 UTMOST has made the first ever discovery of an FRB with an automated system, enabling remarkable time and frequency structures to be seen in the event. The FRB occurred on 27th Aug 2017. It was the first one discovered by Swinburne University of Technology PhD student Wael Farah — who had trained the computers on-site at Molonglo observatory to recognise FRB candidates from the many sources of interference radio telescopes see. His software works so quickly that he is able to save the full time and frequency resolution data on the event for later analysis. This feat has never been acheived before for an initial detection of an FRB. The data reveal remarkable time and frequency structure in the FRB (as seen above). The event has a complex profile in time — with at least three peaks in the emission clearly visible. It also has striking striations and patchiness in the emission as a function of the observing frequency. Where does this patchiness in the FRB’s spectrum arise? It can be partly explained by the effect the Milky Way gas has on a pulse coming from the distant universe — as we think is the case for FRBs. But this can’t be the whole story, as the striations in the spectrum are so narrow that something else must be affecting the pulse. One possibility is that the striations are intrinsic to the source itself and are telling us about the still unknown mechanism that makes FRBs. They might also arise in the Intergalactic Medium — the tenuous ionised gas that lies between galaxies — and telling us about the properties of this gas as the pulse traverses space over hundreds of millions of years before reaching Earth. A paper describing this remarkable FRB has been submitted to Monthly Notices of the Royal Astronomical Society. Congratulations to Wael Farah for this very fine achievement!